LIDL’s top management in Northern Ireland have confirmed to Councilor Cadogan Enright they will no longer levy fines for customers parking at their premises after shopping hours. This announcement followed a ‘Facebook’ campaign by Councilor Enright which has resulted in a lot of unfavorable publicity for LIDL around Down District and Northern Ireland. The system of fines was introduced after problems arose with commuters to Belfast started to monopolise LIDL car parking spaces during the day, leaving no room for actual LIDL customers. The problem with the new system was that (unlike on-street parking in Downpatrick) the fines system applied 24 hours a day – and there was no way a customer could have known that from the signs on the front gate. LIDL has also promised the Councilor Enright that they would urgently review their contract with the private car park operator to ensure that no further fines would be issued in this manner. I am delivering my 8th annual report to every house in every village in Lecale this week to explain to you on how I have been representing your views on Down District Council and other agencies. 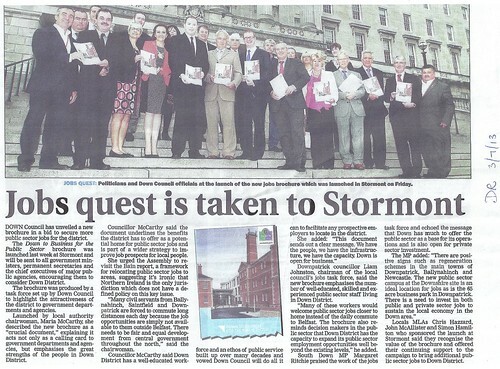 I am the only local councillor to deliver an annual report to every house in Downpatrick. Housing Executive fail to act for 2 years on dreadful pollution incident. Cllr Cadogan Enright reports them to pollution hot line. Jan 30 2013 Quoile Bridge Safe0001, a photo by CadoganEnright on Flickr. 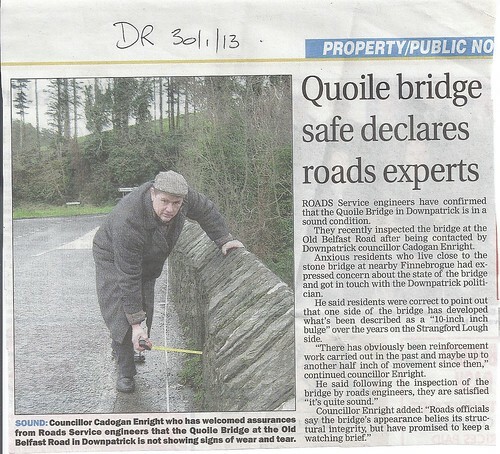 Cllr Cadogan Enright assures that the Quoile Bridge is in safe condition after having organized an inspection of it based on the concerns of nearby residents. Councilor Cadogan Enright and local community PSNI officers have been meeting residents of the Turmennan Road, Scaddy Road and Greystown Road areas over concerns about cars speeding through the area between the A7 Belfast road and The Old Belfast Road. Cllr Cadogan Enright with PSNI offer Owens at Scaddy Road - Greystown Road cross RCouncilor Cadogan Enright and local community PSNI officers have been meeting residents of the Turmennan Road, Scaddy Road and Greystown Road areas over concerns about cars speeding through the area between the A7 Belfast road and The Old Belfast Road. 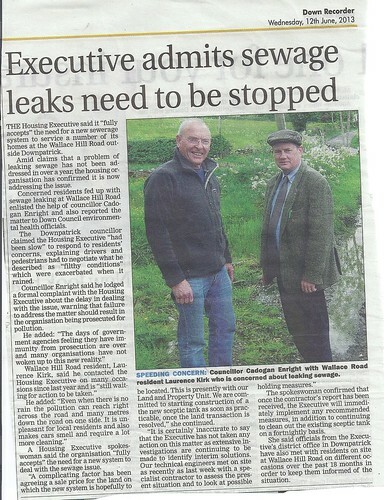 Councilor Cadogan Enright has hit our against a year of delays by the Housing Executive in dealing with sewerage leaks from its properties spreading out down Wallace Hill Road in Ballygally. Cllr Cadogan Enright has called on local political representatives to “stop hankering after the Velodrome, get real , and concentrate on going back to the original plan to upgrade the Downpatrick leisure centre, before our ability to delver it is impeded by cut-backs”. “Politicians in other political parties are still ‘tilting at windmills’ by trying to fight the announcement that the Velodrome Proposal is not going ahead. It was a lucky break for the ratepayers in Down District that the “comprehensive spending review” cancelled the Velodrome. “ Said Cllr Cadogan Enright. “It was essentially the wrong project in the wrong site and would not have been as be accessible as the existing Downpatrick Leisure Centre inDunleathPark. The delays associated with merging the new Downpatrick Leisure centre project with the Velodrome has essentially ensured that we no don’t have a new Leisure centre in Downpatrick and we are back to square one, looking for a site,” Said Cllr Enright.